Our goal in this service is to clean your gutters for you thoroughly and as scheduled making it convenient for you. Once you hire us you won't have to think about it again! We will NOT just show up to your home and use a leaf blower, we would never leave a mess of muddy leaves strewn on your landscaping, we will clean them out by hand, and dispose of the mess. Your rain gutters serve an extremely valuable purpose for your Massachusetts and Cape Cod area roof, exterior, and foundation, but only if you keep up with the gutter cleaning chores. Rain gutters and downspouts route rainwater away from your home, preventing water infiltration into these areas. If leaves build up then water will start to go places where it isn't supposed too. When leaves build up inside your gutters it could prevent water from quickly running off of your roof which can lead to leaks in your eaves and the water can pour over the front of the gutter which will soften the ground around your foundation. All of these problems could lead to very expensive repairs. When your gutters become clogged by debris, they no longer work as intended, leaving your home's exterior vulnerable. Let's face it, gutter cleaning is a chore nobody really wants to do, except perhaps a professional who offers the service. Getting the dirt and debris out of the gutter system is a chore that takes a lot of time and effort. Instead of neglecting the task or doing it yourself, why not call our pros for an estimate? The gutter cleaning specialists at A to Z Softwash have the necessary tools to quickly and easily clean your rain gutters. We completely clean out all debris from your gutter troughs and your downspout so you can rest easy knowing your roof and foundation are protected. Our Cape Cod roof cleaning company can tailor our service to keep your gutters flowing properly with seasonal cleaning, or we would be glad to give your gutters a thorough, one-time cleaning. Give us a call for an estimate today. Your rain gutters contribute to the exterior design of your Cape Cod home. As an extension of the roof, it is hard to hide, so it must be integrated into the décor as a whole. When grime and mildew build up on the outside of the gutter, it creates an eyesore for the whole house. 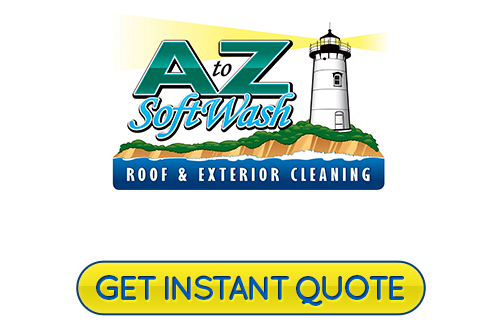 A to Z Softwash cleans the inside as well as the outside of your gutters. Our concern is that you have functioning gutters that are also contributing positively to your aesthetic value. The outside of your gutters is a service that is separate from a basic gutter cleaning. 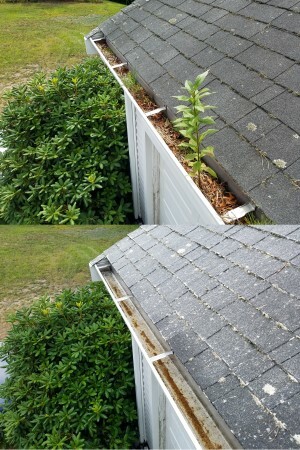 If your gutters suffer from unsightly tiger stripes we DO NOT remove them. There is nothing that will keep the "tiger stripes" away and there are only temporary fixes. It is not caused by dirt or mildew, but is actually an issue in the paint finish. We know how to remove them but feel it is a disservice to provide this service. Your gutters will work and look as good as the day they were installed when you let A to Z Softwash clean them. 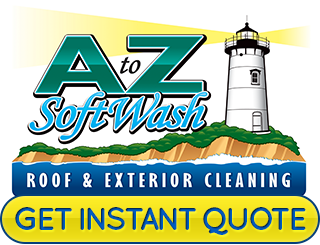 If you are looking for a Cape Cod Gutter Cleaning and exterior softwashing specialist, please call A to Z Softwash at 508-209-7795 or complete our online request form.